This week is packed with fundamental reports for major currencies. Among such reports for the Japanese Yen and the US dollar are the Adjusted Merchandise Trade Balance; Japanese Import & Exports; Leading Economic Index; Coincident Index; and National CPI. The most significant of them all is the BOJ Monetary Policy meeting; FOMC Economic projections; Federal Interest Rate Decision; and FOMC Press Conference. 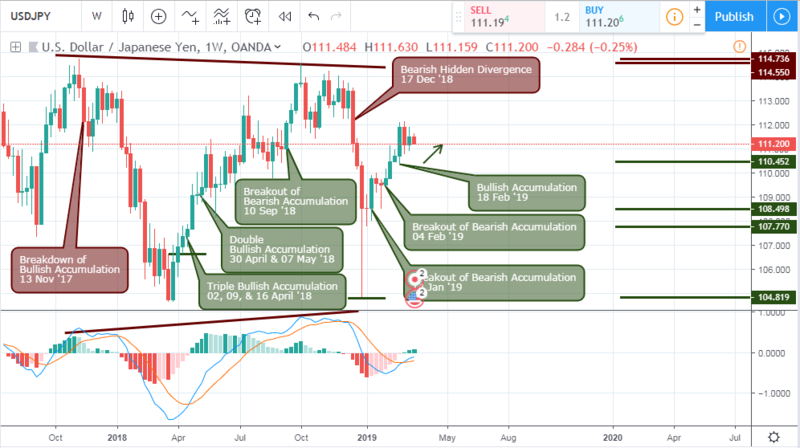 Read on as we carry out a top-down analysis of critical technical patterns that determine USDJPY previous and future trends. The Ministry of Finance on Monday 18th March ‘19 published the Adjusted Trade Balance which measures a balance between import and export and consequently showing trade surplus or deficit. The Japanese economy is mainly dependent on exports. The actual released value came out positive at ¥116.1B, greater than the forecast of ¥-254.4B, indicating bullish sentiment for the Japanese Yen, and possible rise in foreign exchange. The Bank of Japan will on Wednesday publish research of economic changes in Japan after the actual meeting, in a bid to review economic developments inside and outside Japan indicting current fiscal policy. A hawkish outcome of the BOJ minutes shows bullish sentiment for the Japanese Yen, while a dovish outlook shows a bearish outlook. This coming Friday 22nd March ’19, the Fed will be publishing a report showing the FOMC’s inflation projections and growth of the US economy in 2years time. This report presents the analysis and forecasts of the interest rate by individual FOMC members. On the 22nd March ’19, the Federal Reserve’s Board of Governors will be in a meeting to device economic policies mainly directed towards interest rates priced on loans as well as advances to commercial banks. A hike in rates implies a strong US dollar, while a rate cut is considered as negative for the USD. Should the rates remain as the previous value, then traders will usually access the FOMC state for a hawkish or dovish outlook. 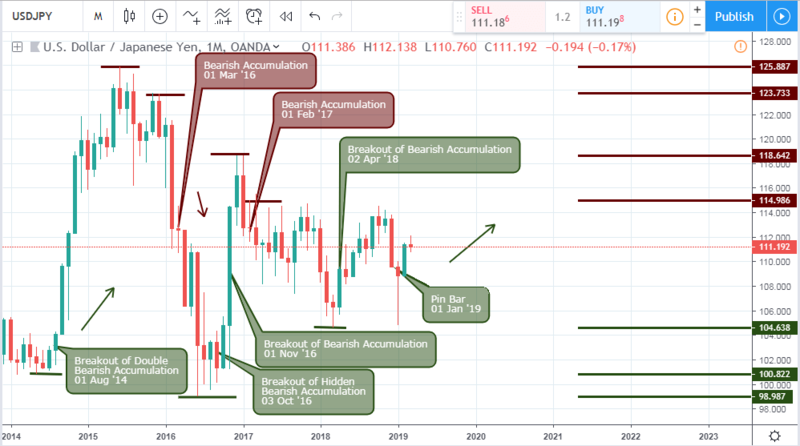 The USDJPY started a bullish campaign by first triggering a breakout of bearish accumulation on August ’14, at risk of 3.5% forced the USD to rise by 20.75%. Later on March ’16, a sudden rise in volatility in combination with a bearish pressure signaled to a price collapse of the critical support level of 118.642. From that point onward, the monthly chart continued into sharp bullish and bearish swings triggered on 03 October ’16, February ’17, and 02 April ’18. Starting with a failure of bullish pressure on 13 November ’17, the USDJPY price slumped by 6.6%, a very bearish outlook for the Yen. A counter bullish pattern in the form of a triple bullish pressure from 02, 09, and 16 April ’18, brought an end to the bearish trend and ushered in a bullish campaign. This bullish rise lasted for 23 weeks and a 6.6% rise. As analyzed from a previous post, a bearish hidden divergence, confirmed by a dead cross of the MACD oscillator saw the pair crashing down for a 5.68% in 2 weeks. After the sudden price drop, the pair signaled a bearish pressure point on 07 January ’19, which failed to a bullish price breakout on 14 Jan ’19, from which price has so far risen by an opposite 2.13%. From a daily chart overview, the bearish price decline of late November ’18 gave a precise entry in the form of a breakdown of bullish pressure on 04 December ’18. This served as confirmation to the bearish hidden divergence on the weekly chart. 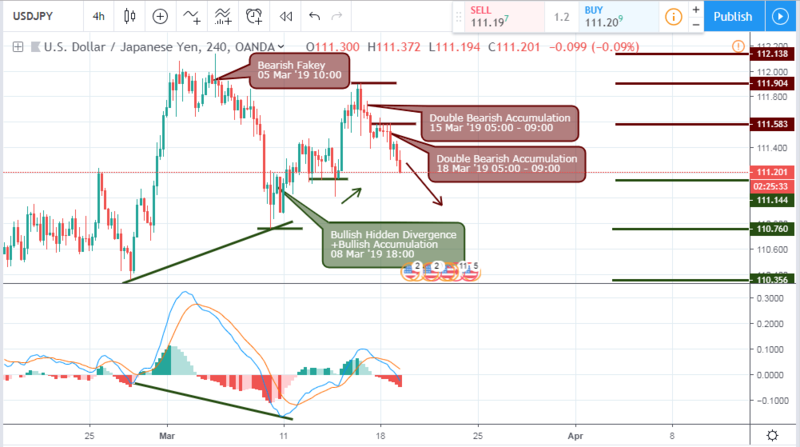 Following a bullish price recoil from the sudden price plummet, the pair slowly entered into a bearish hidden divergence pattern, which is confirmed by a dead cross of the MACD indicator on the subwindow. 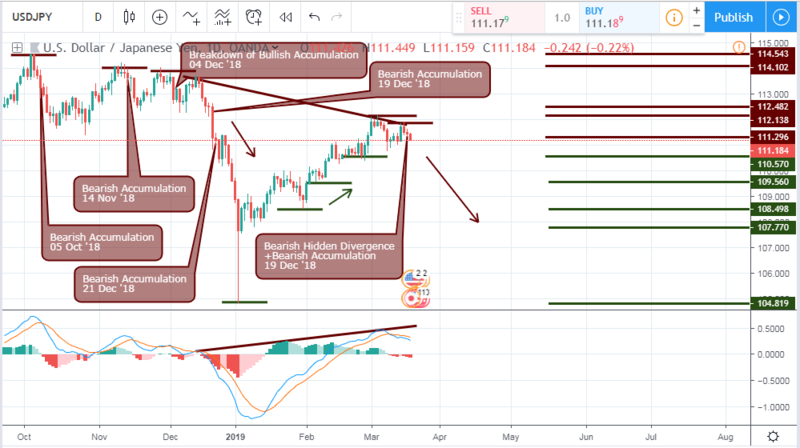 With the formation of double accumulation patterns triggered on March 15 and 18 of the 4hour time frame, as well as hidden bearish divergence on the daily chart, we project a midterm price decline going forward. You may wish to stop by at the broker section of our site for a list of hand-vetted US binary options brokers, and take advantage as most of them offer interesting welcome bonuses that can get you started with risk-free trading.